Publications on CAT (Civil Air Transport), General C. Chennault, etc. Original brand new, signed copies available for $35, postage included. 15234 Afton Hills Court S.
The Pictorial History is currently unavailable, but there are plans for another printing due to high interest. by: Robert Lee Scott, Jr. Currently unavailable from Amazon and out of print, but may be found in used books stores and websites. This e-book lists the individual history of all aircraft ever operated by Air America including all known accidents. As the “birth date” of Air America was 31 March 1959, CAT aircraft are only dealt with if they still existed after that date. Files of interest to readers of the CAT Association are those about the Bell 47, Goose, B-26, C-47, C-46, PBY, B-17, C-54, DC-6, and the Jets. This e-book tries to give a detailed history of Air America and its predecessor Civil Air Transport. 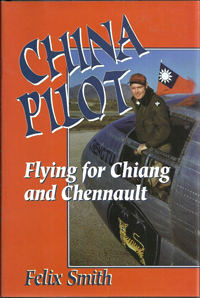 It starts with 2 files about CAT operations in Mainland China, then deals with several aspects of CAT operations on Taiwan (structure, scheduled and charter flights, work for the US Government), then presents CAT operations “in remote countries” like New Zealand, Guatemala or Indonesia, and finally deals with operations that began at the times of CAT and still existed at the times of Air America like the Technical Services Division at Tainan, operations out of Japan (including CAT during the Korean War), operations run out of Kadena and Clark Air Bases and missions to Tibet flown by CAT and later Air America.